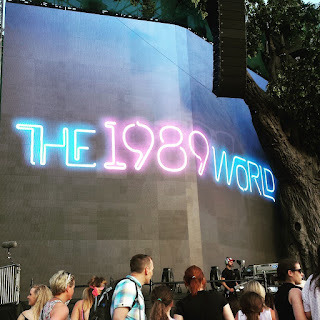 27th June 2015: Probably one of the most well-known artists in the world currently, with millions of fans globally, superstar best friends and legs that seem never ending - Taylor Swift hits Hyde Park for the last gig in the UK on her 1989 World Tour and not only is she performing in Hyde Park it completely sold out. I don't think I have ever seen such dedication from fans than Taylor Swift's fan, they pull out all the stops - costumes, outfits, posters, LED posters, everything you could possible imagine her fans are doing. Swift hit the stage with the first track of the night Welcome to New York, which is where 1989 was written. The night was a journey and an insight in to the creation of 1989. We were told that after her performance in London years before she had decided that she was going to move and live in New York, she wasn't in love at the time but wanted to write an album all about it. With Swift's songs it's almost like you're reading her diary, they are very personal, she sang through the album with emotion and energy. Songs included Blank Space, All You Had To Do Was Stay. We were also treated to Love Story, which was given a more a pop vibe than the original, Swift explained that it was her way of rewriting Romeo and Juliet. We Are Never Ever Getting Back Together always seems to get a great reception, I think a lot of people can relate to the song. Ahead of her performance of the song Clean, Swift took an opportunity to talk about the meaning behind the song, suspended high above the crowd on a platform that spins. Swift spoke to 65,000 people and told them that they should never define themselves by the opinion of others, and reminding them that "making mistakes doesn't mean you're damaged goods". I felt a great sense of admiration for Swift, she had the ability to make thousands of teenage girls listen to her every word and she didn't miss the opportunity to empower them, taking a look round the audience some people had tears rolling down their faces. What was more admirable was it didn't just end up being young girls that were touched by her words, it was everyone. Bad Blood the newest single from Swift was a great production, you have to give props to her dancers, absolutely amazing. 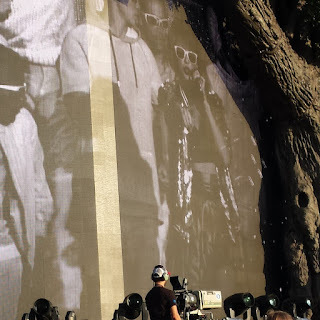 During the song Style the audience were treated to an introduction to Swift's friends, Kendall Jenner, Gigi Hadid, Serena Williams, Martha Hunt, Karlie Kloss and Cara Delevingne. I don't think the screams could have been any louder. The night ended with the crowd pleaser Shake It Off and it was the perfect way to end the evening. A great show and an even better experience. Swift was in awe nearly the whole of her performance, watching 65,000 people sing and dance to her songs, clearly had an emotional affect on her and that's what made it nice, she is grateful for everything and works for it. I do hope some of the advice she gave the crowd rubbed off a little.